Sign up early or day of race. 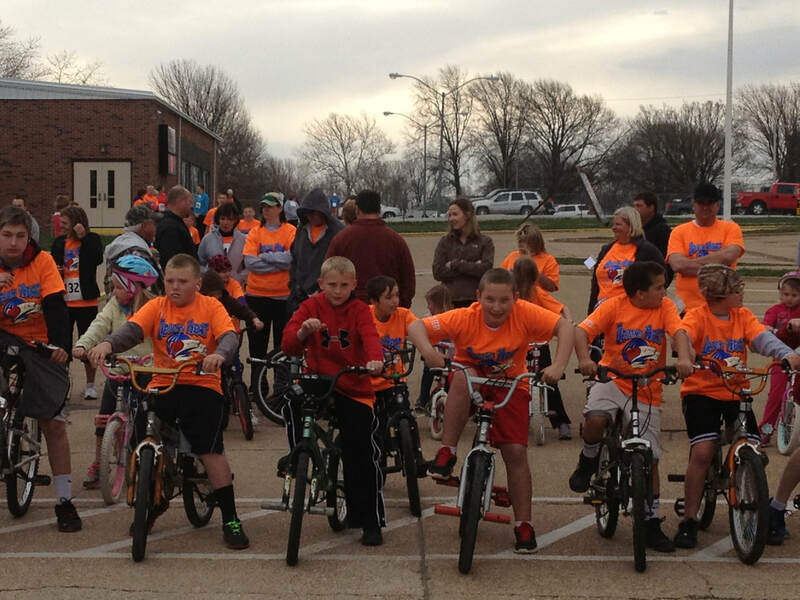 7th annual 5k is April 6th at The First Baptist Church Foster Hall in Lincoln, MO. Breakfast is from 7-11am, Registration starts at 8am. 5k begins at 9am. There is a fun run 100 yard dash at 10am and awards ceremony at appoximately 10:30 am. 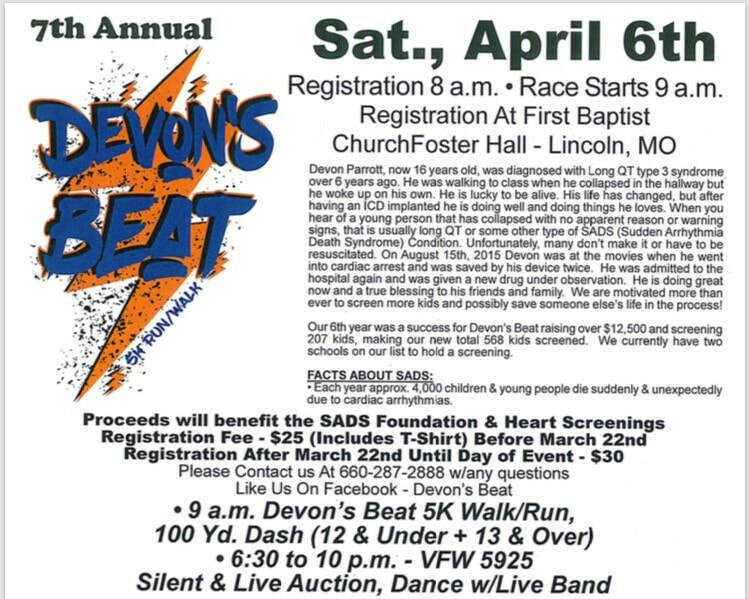 Devon's Beat is in honor of our son Devon Parrott. He helps spread awareness about SADS (sudden arrhythmia death syndrome) conditions and is very passionate about encouraging parents to get their kids screened! He was diagnosed at the age of 10 and he said "when life puts an obstacle in your way you have to go around it." Devon is now 16 and living a very full and active life. Meet Angela Parrott aka Mom! When my son fainted at school and was told he was not only lucky to be alive but that he was at a high risk of cardiac arrest I knew i had to do something to keep myself busy. I quickly learned through research that Long QT was not rare and very few people had any info on it. So I went to work with the help from lots of friends and family. What started out to be an awareness fundraiser about Long QT and other SADS conditions turned to my mission to get kids free heart screening in our community. Because I learned that most SADS conditions are detectable and treatable if caught early but in most cases the first warning sign is Death. Meet the rest of the Parrott Family. Jason Parrott aka Dad, Dawson Parrott (younger brother) and Hawkeye the dog. 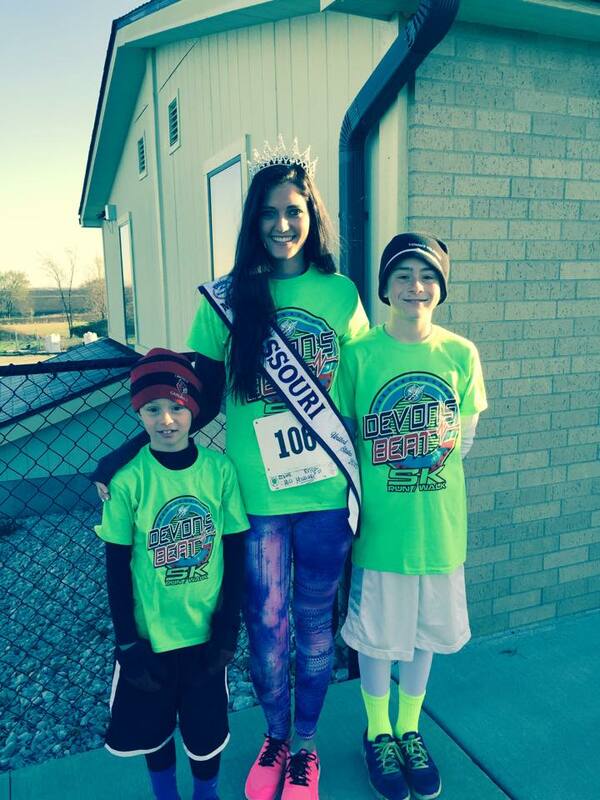 Devon's beat started in 2013 just 5 months after Devon was diagnosed. It could not of been done with out support and help from the whole family. Dawson has always helped out by keeping a close eye on Devon and has enjoyed running the race every year. Dawson was only 5 years only when his brother first went into cardiac arrest. Jason always has the heavy lifting jobs during Devon's Beat! He makes sure our signs and banners get out and everything goes smoothly. This is a family event but couldn't be possible with out all of our friends, families, volunteers, and participants. CLICK HERE TO LEARN MORE ABOUT OUR SCREENING PARTNER?